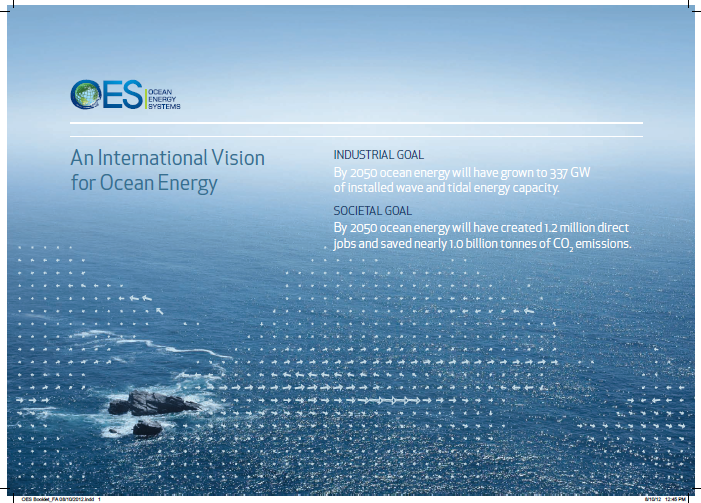 An International Vision for Ocean Energy was developed by Ocean Energy Systems (OES) in close collaboration with the IEA (International Energy Agency) modelling team in 2012. It provides the 2050 international goals and background information about ocean energy as well as challenges faced by the industry. IEA-OES (International Energy Agency - Ocean Energy Systems) is an intergovernmental collaboration between countries, which operates under framework established by the International Energy Agency in Paris and consisting of 20 member countries. It was launched in 2001 to bring together countries to advance research, development and demonstration of conversion technologies to harness energy from tides, waves, currents, temperature gradient and salinity gradient as well as desalination through international cooperation and information exchange. The Policy and Innovation Group have co-authored the International Vision for Ocean Energy and established cost and deployment trends which served as inputs to the IEA modelling team, thus enabling it to make credible inclusion of ocean energy trend data for the first time.